Masterbatch Market size was estimated over USD 9 billion in 2017 and the industry will grow by a CAGR of more than 5% up to 2024. The global masterbatch market will be augmented by increasing demand from automotive industry in Asia Pacific countries. As the demand for light weight vehicles have been rising in the recent years, most automotive manufacturers are substituting metals parts with plastic materials. This would increase the demand for masterbatch products among automotive component manufacturers. The product is popularly used in providing color, mainly black or white, as well as the required performance features to the engineering plastics used in the interior, exterior, as well as under the hood applications. Continuous product developments in the market to enhance the light stability and surface appearance will have a positive influence on the product demand in the automotive sector. Supportive government regulations and policies, improving disposable income & rising urbanization would increase the demand for personal vehicles in the emerging nations and would in turn boost the masterbatch market growth in the forecast timeframe. Increasing product price would hamper the growth of the market in coming years. This is attributed to the rising price of its raw materials like black carbon, titanium oxide, pigments etc. Changing market dynamics in terms of supply and demand ratio owing to heavy demand from suppliers, is increasing the raw material prices which is negatively impacting the market. Moreover, stringent government regulation controlling masterbatch color & additive application in food products are restraining the market. Based on product, the market has been segmented into black, white, color and additive. 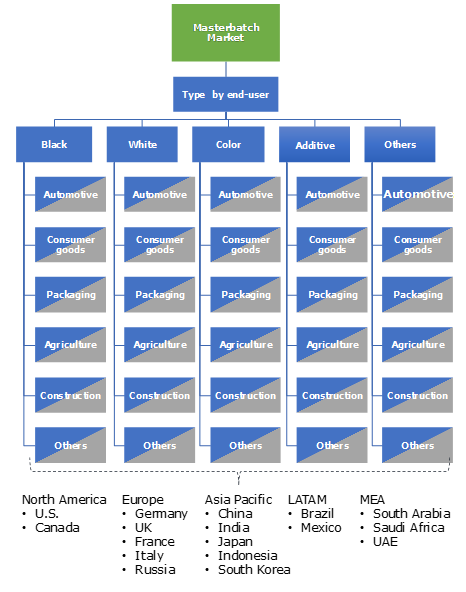 Black masterbatches dominate the market owing to its extensive application in the automotive and electronics industry. These are basically carbon black pigment dispersed in polymer which provides color to the plastic components. It offers deep color and required aesthetic properties to the plastic products. They are ideally used for applications which require unique features like electrical conductivity, ultraviolet light stability, resistance to high temperatures, heat dissipation, and uniform distribution with high jetness. It is the largest product segment in the masterbatch market which will gain by a CAGR of more than 5.5% during the forecast timeframe. Based on end-user, the masterbatch market is segmented into automotive, consumer goods, packaging, agriculture, construction and others. Automotive industry is a significant end-user segment which will grow by close to 6% during the forecast timeframe. This sector is witnessing a sharp shift from using metal parts to plastics in order to reduce the vehicle weight and improve the fuel efficiency. The product is popularly used in providing color, mainly black or white, as well as the required performance features to the engineering plastics used in the automotive applications. The rising automobile production in developing regions would lead to increased demand for plastic components which would in turn increase the demand for masterbatch products in the forecast timeframe. In agriculture, black, white and color product types are widely used in greenhouse frames & films, irrigation systems, mulch films, etc. Color masterbatches are distinguished by their exclusive ability to reflect, absorb or transmit specific sections of the light spectrum and have superior features such as ease of processing, high durability and high stability. Asia Pacific is the largest market in the world, driven by rising demand from China, India and Japan. Continuously growing population is one of the major reasons driving the regional market, along with rapid industrial growth, developing automotive industry and improving disposable income. The masterbatch market of this region generated a revenue of about USD 4.5 billion in 2017. Moreover, the regional governments have initiated policies and development plans which would boost the growth of the market in forecast timeframe. Another important masterbatch market is Europe which will gain by a CAGR of approximately 4% during the forecast timeframe. Rising demand from countries like Germany, UK, Italy, France etc. would drive the market in the region. 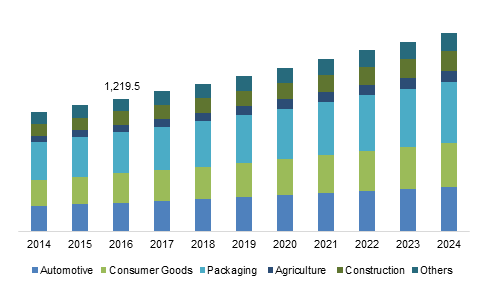 The major growth driver of the market is the rising demand from regional automotive and packaging industries. Global masterbatch market is characterized by the presence of many global and regional companies. Some of the major players in the market includes Ampacet, Clariant, Tosaf Group, A. Schulman, Inc., Hubron International, PolyOne, Plastiblends, Cabot, and many more. Key market players such as Clariant, A. Schulman, and Hubron are involved in expansion of their production capacities to meet the demand from end-user industries. . Other players such as PolyOne, RTP company and Tosaf Group are acquiring other companies to enhance their global footprints and product portfolio. The products in the masterbatch market offer color to polymers, and is manufactured from various pigments and dyes. These are processed with polymers or resins to add color which is then used for several applications. In the coming years, the demand of biodegradable products will increase, especially for agricultural applications. Rising research and development activities in the masterbatch industry would further increase the efficiency of the product in the forecast timeframe. In the coming years, most companies in the market would look for strategic alliances for better integration along the value chain to occupy greater market share.